In taxonomy, Methanocaldococcus is a genus of the Methanocaldococcaceae. Methanocaldococcus formerly known as Methanococcus is a genus of coccoidmethanogens. They are all mesophiles, except the thermophilic M. thermolithotrophicus and the hyperthermophilic M. jannaschii. The latter was discovered at the base of a “white smoker” chimney at 21°N on the East Pacific Rise and it was the first archaeangenome to be completely sequenced, revealing many novel and eukaryote-like elements. M. jannaschii is the first archae bacterium to be sequenced by Craig Venter's group. M. jannaschii publication detail with an abstract 1996. Science. 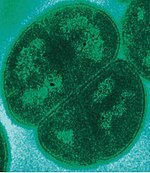 ^ See the NCBIwebpage on Methanocaldococcus. Data extracted from the "NCBI taxonomy resources". National Center for Biotechnology Information. ftp://ftp.ncbi.nih.gov/pub/taxonomy/. Retrieved 2007-03-19. ^ W.J. Jones, et al. (December 1983). "Methanococcus jannaschii sp. nov., an extremely thermophilic methanogen from a submarine hydrothermal vent". Arch. Microbiol. 136 (4): 254–261. doi:10.1007/BF00425213. ^ C.J. Bult, et al. (August 1996). "Complete genome sequence of the methanogenic archaeon, Methanococcus jannaschii". Science 273 (5278): 1058–1073. doi:10.1126/science.273.5278.1058. Whitman, WB (2001). "Genus I. Methanocaldococcus gen. nov.". In DR Boone and RW Castenholz, eds.. Bergey's Manual of Systematic Bacteriology Volume 1: The Archaea and the deeply branching and phototrophic Bacteria (2nd ed.). New York: Springer Verlag. ISBN 978-0387987712. Whitman WB, Boone DR, Koga Y (2001). "Family II. Methanocaldococcaceae fam. nov.". In DR Boone and RW Castenholz, eds.. Bergey's Manual of Systematic Bacteriology Volume 1: The Archaea and the deeply branching and phototrophic Bacteria (2nd ed.). New York: Springer Verlag. ISBN 978-0387987712. This page was last modified on 14 November 2010, at 05:55.